UNG alumnus Maj. General Stephen Fogarty, chief of staff of the U.S. Cyber Command, was the keynote speaker at the second annual Security Symposium, "Civil-Military Cooperation and International Collaboration in Cyber Operations" held Nov. 8-9 on the Dahlonega Campus. Among the many attendees at the University of North Georgia (UNG) second annual security symposium, "Civil-Military Cooperation and International Collaboration in Cyber Operations" held Nov. 8-9 on the Dahlonega Campus were a 10 uniformed men and women from around the world who literally grew up with the internet. 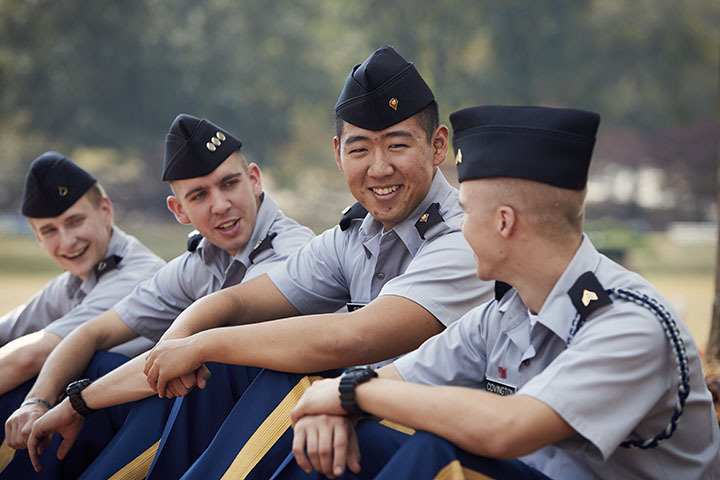 The cadets, all in their early 20s, attended the conference to learn more from presenters and each other on how to better deal with the rising rate of cyber threats. Vinícius Chitolina, 23, a fourth-year cadet graduating in military sciences from Agulhas Negras Military Academy, Resende, Rio de Janeiro, Brazil, was selected by his commanding officer from a group of his classmates to attend the conference after winning an essay-writing competition. Chitolina was also part of a group of cadets who presented posters based on topics related to the conference. His poster outlined "Use of force in cyberspace under Article 2(4) of the United Nations Charter: an analysis of stuxnet virus based on "Schmitt Criteria" in cyber-attacks." "I was excited about being able to come here and learn about how to better defend my country's cyber network," Chitolina said. "These cyberattacks and terrorists will only get worse, and we are my country's next line of defense in this kind of a war." Presented by UNG's Institute for Leadership and Strategic Studies (ILSS), Center for Cyber Operations Education at the Mike Cottrell School of Business, College of Arts and Letters, and UNG Press, the symposium featured a number of guest speakers, panel discussions which included scholarly paper presentations and poster sessions. Cadet Luri Khijakadze, 21, a "junker" (cadet) at the National Defence Academy of Georgia, said his interest in IT and cyber issues has led to an increased desire to learn more in those fields. "There are a number of people from other nations here, they can talk about different ways to fight cyber terrorists," Khijakadze said, standing next to his poster. It outlined a 2008 cyberattack that halted all electronic communications in the Republic of Georgia for two days. "Talking to others that have a higher level of knowledge on these subjects, I can get better ideas to help my country fight in cyberspace." The symposium's keynote speaker was UNG alumnus Maj. Gen. Stephen Fogarty, chief of staff of the U.S. Cyber Command. Fogarty has a bachelor's degree in history from UNG, and is a graduate of the U.S. Army War College with a master's of science degree in strategic studies. He also holds a master's of science degree in administration from Central Michigan University. 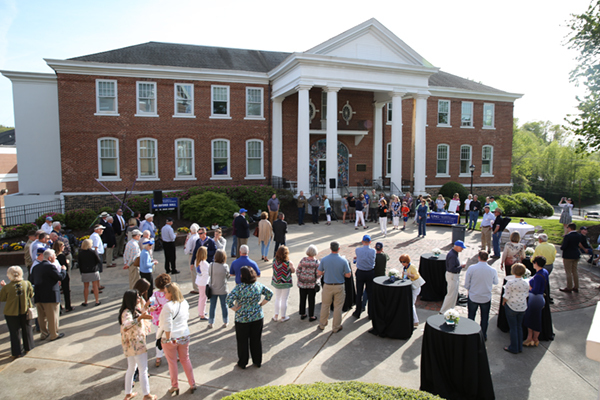 Fogarty's message to attendees that included UNG faculty and students, government agency leaders and active military personnel, spanned a broad range of cyber-related topics, threats and challenges facing the U.S. and our allies, both now and in the future. He reinforced the importance of the symposium's theme of civil-military cooperation and international collaboration in cyber operations. 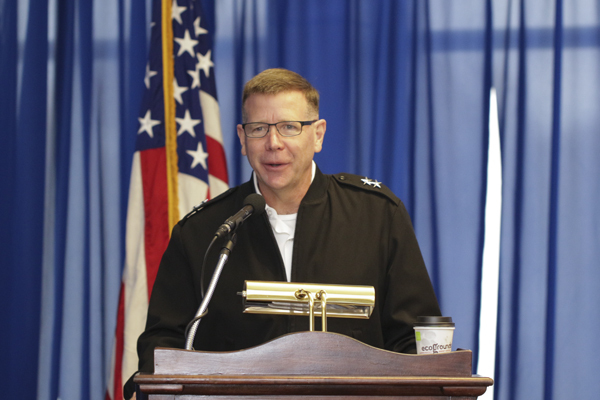 He emphasized that the U.S. Army is making much progress in the cyber domain fight. "For the first time in its history, you can join the army, enter the cyber corps from the very beginning of your enlistment, and stay there your entire military career," Fogarty said. Fogarty went on to say that this is a unique period in the history of the world, where one "bad actor," with a laptop can take over or cripple a nation's entire cyber network. To combat that threat, nations must go on the offensive. "You better have game," Fogarty said. "You absolutely need to employ it if necessary, to not be afraid to use it." For more information on the UNG Security Symposium, visit the website.